This name uses Spanish naming customs: The first or paternal family name is Moscoso, the second or maternal family name is Rodríguez and the marital name is Arias. 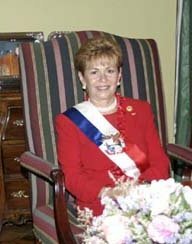 Mireya Elisa Moscoso Rodríguez de Arias (born July 1, 1946) was Panama's first female president, serving from 1999 to 2004. Born into a poor family, Moscoso became active in the 1968 presidential campaign of three-time president Arnulfo Arias, following and marrying him when he went into exile after a military coup. After his death in 1988, she assumed control of his coffee business and later his political party, the Arnulfista Party (PA). During the 1994 general elections for the presidency, she narrowly lost to the Democratic Revolutionary Party (PRD) candidate Ernesto Pérez Balladares by 4% of the vote. In the 1999 general election, she defeated the PRD candidate Martín Torrijos by 8% to become Panama's first female president. During her tenure in office, she presided over the handover of the Panama Canal from the US to Panama and the economic downturn that resulted from the loss of US personnel. Hobbled by new spending restrictions passed by the opposition-controlled Legislative Assembly, and her administration's corruption scandals, she had difficulty passing her legislative initiatives. Her popularity declined, and her party's candidate José Miguel Alemán lost to the PRD's Torrijos in the subsequent general elections to succeed her. Moscoso is the daughter of a schoolteacher and was born into a poor family in Pedasí, Panama as the youngest of six children. She later worked as a secretary and joined the 1968 presidential campaign of Arnulfo Arias; Arias had already served two partial terms as president, both times being deposed by the Panamanian military. He won the presidency but was again deposed by the military, this time after only nine days in office. Arias went into exile in Miami, Florida in the US, and Moscoso followed, marrying him the subsequent year. She was 23, and he was 67. During this period, Moscoso studied interior design at Miami-Dade Community College. After Arias' 1988 death, she inherited his coffee business. On September 29, 1991, almost two years after the US invasion of Panama that overthrew Manuel Noriega, she became president of her former husband's Arnulfista Party. Also in 1991, Moscoso married businessman Richard Gruber. The couple adopted a son, Richard (born 1992). Moscoso and Gruber divorced in 1997. In 1994, Moscoso ran as the presidential candidate of her deceased husband's Arnulfista Party (PA) in the general election, seeking to succeed PA president Guillermo Endara. Her main rivals were Democratic Revolutionary Party (PRD) candidate Ernesto Pérez Balladares and salsa singer Rubén Blades, who was then president of the party Papa Egoro. Moscoso and Blades sought to emphasize Pérez Balladares' connection with military ruler Manuel Noriega, broadcasting pictures of the two together, while Pérez Balladares worked to position himself as a successor to military ruler Omar Torrijos, who was regarded as a national hero. Moscoso's campaign, meanwhile, was hindered by public dissatisfaction with the perceived incompetence and corruption of Endara's government. Pérez Balladares ultimately won the election with 33% of the vote, with Moscoso receiving 29% and Blades receiving 17%. Moscoso was named the PA candidate again in the May 2, 1999 general election. Her main opponent this time was Martín Torrijos, Omar Torrijos' son, named to represent the PRD after the failure of a constitutional referendum that would have allowed Pérez Balladares to run for a second term. Torrijos was selected in part to try to win back left-leaning voters after the privatizations and union restrictions instituted by Pérez Balladares. Moscoso ran on a populist platform, beginning many of her speeches with the Latin phrase "Vox populi, vox Dei" ("the voice of the people is the voice of God"), previously used by Arias to begin his own speeches. She pledged to support education, reduce poverty, and slow the pace of privatization. While Torrijos ran in large part on his father's memory—including using the campaign slogan "Omar lives"—Moscoso evoked that of her dead husband, leading Panamanians to joke that the election was a race between "two corpses". Torrijos allies also criticized Moscoso for her lack of government experience or college degree. However, unlike in 1994, it was now the PRD that was hampered by the scandals of the previous administration, and Moscoso defeated Torrijos with 45% of the vote to 37%. Moscoso took office on September 1, 1999. Because she was divorced when she assumed the presidency, her older sister Ruby Moscoso de Young served as her First Lady. Facing a PRD-controlled Legislative Assembly, Moscoso was limited in her ability to make new policy. She was also hampered by strict new restraints Pérez Balladares had passed on spending public money in the final days of his term, targeted specifically at her administration. On December 31, 1999, Moscoso oversaw the handover of the Panama Canal from the US to Panama under the Torrijos-Carter Treaties. Her government then faced the challenge of cleaning up environmental problems in the Canal Zone, where the US Army had long tested bombs, biological agents, and chemical weapons. Remaining issues included lead contamination, unexploded munitions, and stockpiles of depleted uranium. Though Moscoso fired all of Pérez Balladares' appointments from the Panama Canal Authority and appointed supermarket magnate (and future president) Ricardo Martinelli as its head, the Authority retained its autonomy from her administration. At the same time, Panama's economy began to struggle due to the loss of income from American canal personnel. Moscoso worked to end Panama's role in international crime, passing new laws against money laundering and supporting tax transparency. The legislation allowed Panama to be removed from international lists of tax havens. Meanwhile, violent crime rose sharply during Moscoso's tenure. In September 2000, under pressure from the US and some Latin American governments, Moscoso's government gave temporary asylum to former Peruvian spy chief Vladimiro Montesinos, who had fled Peru after being videotaped bribing a member of its congress. In December 2000, human remains were discovered at a Panamanian National Guard base, incorrectly believed to be those of Jesús Héctor Gallego Herrera, a priest murdered during the Omar Torrijos dictatorship. Moscoso appointed a truth commission to investigate the site and those at other bases. The commission faced opposition from the PRD-controlled National Assembly, who slashed its funding, and from PRD's president Balbina Herrera, who threatened to seek legal action against the president for its creation. It ultimately reported on 110 of the 148 cases it examined, of which 40 had disappeared and 70 were known to be murdered. The report concluded that the Noriega government had engaged in "torture [and] cruel, inhuman, and degrading treatment", and recommended further exhumation and investigation. During her term, Moscoso was often accused of nepotism for her administrative appointments and faced several corruption scandals, such as the unexplained gift of US$146,000 in watches to Legislative Assembly members. By 2001, her second year in office, Moscoso's approval rating had fallen to 23%, due to corruption scandals and concern for the economy. That year, she attempted to pass a tax reform package through the Legislative Assembly, but the proposal was opposed by both the private sector and organized labor. In 2003, the US ambassador publicly criticized Moscoso for the growth of corruption during her term. By the end of her term, her presidency was "criticized as rife with corruption and incompetence" and "widely regarded as weak and ineffectual". Herself barred by the Constitution of Panama from a second consecutive term, Moscoso was succeeded by her former rival Martín Torrijos in the 2004 election. Shortly before leaving office, Moscoso sparked controversy by pardoning four men—Luis Posada Carriles, Gaspar Jiménez, Pedro Remon, and Guillermo Novo Sampol—who had been convicted of plotting to assassinate Cuban president Fidel Castro during a 2000 visit to Panama. Cuba broke off diplomatic relations with the country, and Venezuelan president Hugo Chávez recalled the nation's ambassador. Moscoso stated that the pardons had been motivated by her mistrust of Torrijos, saying, "I knew that if these men stayed here, they would be extradited to Cuba and Venezuela, and there they were surely going to kill them there." Moscoso also issued pardons to 87 journalists for defamation convictions dating back as far as 14 years. On July 2, 2008, all of the 180 pardons Moscoso had issued were overturned as unconstitutional by the Supreme Court. During the Torrijos presidency, Moscoso remained an active member of the opposition. In September 2007, she criticized the appointment of PRD politician Pedro Miguel González, who was wanted in the US for the murder of US Army sergeant Zak Hernández, as the head of the National Assembly. In the same year, she joined Endara and Perez Balladares in lobbying the Organization of American States to investigate the Hugo Chavez government's refusal to renew the broadcasting license of opposition station Radio Caracas Televisión Internacional in Venezuela. Since leaving office, Moscoso has also served as a member of the Woodrow Wilson International Center for Scholars' Council of Women World Leaders, a network intended "to promote good governance and enhance the experience of democracy globally by increasing the number, effectiveness, and visibility of women who lead at the highest levels in their countries." ^ David Gonzalez (September 2, 1999). "In Panama's New Dawn, Woman Takes Over". The New York Times. Archived from the original on September 15, 2012. Retrieved September 15, 2012. ^ a b c d e f g "Mireya Moscoso". Encyclopædia Britannica. Archived from the original on September 15, 2012. Retrieved September 15, 2012. ^ a b c "Mireya Moscoso de Arias". Centro de Estudios y Documentacion Internacionales de Barcelona. Archived from the original on December 15, 2012. Retrieved December 14, 2012. ^ Harding 2006, p. 66. ^ a b c d Harding 2006, p. 129. ^ a b "Awaiting the lady". The Economist. – via HighBeam Research (subscription required). August 28, 1999. Archived from the original on March 7, 2016. Retrieved September 15, 2012. ^ a b c Mireya Navarro (May 3, 1999). "The Widow Of Ex-Leader Wins Race In Panama". The New York Times. Archived from the original on September 15, 2012. Retrieved September 15, 2012. ^ Howard W. French (February 21, 1994). "Panama Journal; Democracy at Work, Under Shadow of Dictators". The New York Times. Archived from the original on September 3, 2012. Retrieved September 2, 2012. ^ a b Douglas Farah (May 9, 1994). "Panamanians Vote in Peace, Picking Ex-Aide of Noriega; Millionaire Perez Balladares Bests Widow of Four-Time President". The Washington Post. Archived from the original on March 29, 2015. Retrieved September 2, 2012. ^ "Panama". University of Missouri-Saint Louis. Archived from the original on September 3, 2012. Retrieved September 2, 2012. ^ a b Serge F. Kovaleski (May 3, 1999). "Moscoso Is First Woman Elected to Panamanian Presidency". The Washington Post. – via HighBeam Research (subscription required). Archived from the original on April 16, 2017. Retrieved September 15, 2012. ^ "Ninth Conference of Spouses of Heads of State and Government of the Americas". Summits of the Americas Secretariat. Archived from the original on December 15, 2012. Retrieved December 14, 2012. ^ Harding 2006, p. 130. ^ a b Harding 2006, p. 131. ^ "Becalmed". The Economist. – via HighBeam Research (subscription required). September 22, 2001. Archived from the original on October 30, 2017. Retrieved September 15, 2012. ^ a b "Colombia and its neighbours". The Economist. – via HighBeam Research (subscription required). October 7, 2000. Archived from the original on March 15, 2016. Retrieved September 15, 2012. ^ a b c Harding 2006, p. 134. ^ "Truth Commission Delivers Its Final Report on Victims of the 1968–1988 Military Regime". NotiCen – via HighBeam Research (subscription required). May 2, 2002. Archived from the original on September 24, 2015. Retrieved November 4, 2012. ^ Serge F. Kovaleski (January 18, 2000). "Panamanians Sound Alarm Over Gift Watches". The Washington Post. – via HighBeam Research (subscription required). Archived from the original on April 15, 2016. Retrieved September 15, 2012. ^ "President Mireya Moscoso asks legislature for tax reform, but prospects are dim". The Economist. – via HighBeam Research (subscription required). March 15, 2001. Archived from the original on March 4, 2016. Retrieved September 15, 2012. ^ "Not his father's son? Panama's new president". The Economist. – via HighBeam Research (subscription required). May 8, 2004. Archived from the original on September 28, 2014. Retrieved September 18, 2012. ^ Mary Jordan (May 2, 2004). "General's Son Leads in Panama". The Washington Post. – via HighBeam Research (subscription required). Archived from the original on April 14, 2016. Retrieved September 15, 2012. ^ "Manifest destiny meets democracy". The Economist. – via HighBeam Research (subscription required). May 1, 2004. Archived from the original on November 20, 2018. Retrieved September 15, 2012. ^ Steven R. Weisman (September 2, 2004). "Panama's New Chief, Sworn In, Inherits a Diplomatic Tempest". The New York Times. Archived from the original on September 15, 2012. Retrieved September 15, 2012. ^ Glenn Kessler (August 27, 2004). "U.S. Denies Role in Cuban Exiles' Pardon". The Washington Post. Archived from the original on September 15, 2012. Retrieved September 15, 2012. ^ Juan Zambrano (July 2, 2008). "Panama's Supreme Court overturns 2004 pardons, including of anti-Castro militant". Associated Press – via HighBeam Research (subscription required). Archived from the original on March 8, 2016. Retrieved October 29, 2012. ^ Steve Inskeep (September 4, 2007). "Election of Panamanian Official Strains U.S. Ties". Morning Edition. National Public Radio. Retrieved October 29, 2012. ^ Diana Cariboni (May 31, 2007). "Criticisms of Caracas Reveal Double Standard". Inter Press Service. – via HighBeam Research (subscription required). Archived from the original on March 4, 2016. Retrieved October 29, 2012. ^ "MObama & the first ladies: Does she who rocks the pillow talk rule the world?". goldengirlfinance.ca. September 17, 2012. Archived from the original on December 15, 2012. Retrieved December 14, 2012. ^ "Council of Women World Leaders Biographies" (PDF). The Wilson Center. Archived (PDF) from the original on December 15, 2012. Retrieved December 14, 2012. ^ "Council of Women World Leaders". The Wilson Center. December 15, 2012. Archived from the original on December 15, 2012. Retrieved December 14, 2012. Harding, Robert C. (2006). The History of Panama. Greenwood Press. ISBN 031333322X.